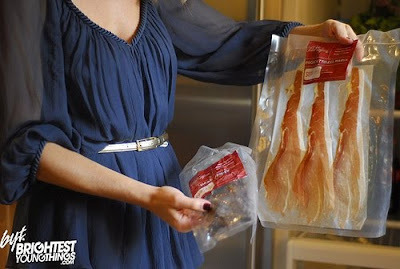 Me showing off some fab Red Apron "Del Marva" prosciutto and beef jerky from my fridge. This month, the fine folks over at BrightestYoungThings.com have been poking around in the refrigerators of chefs, food writers and other assorted food people, and last week they raided mine. See what's in my fridge over on BYT. I like this feature. It makes me feel better about the chaos in my fridge.